When raised within a certain belief system, we tend to assume our way of thinking is generally the correct one and that it’s rooted in absolute truth. What happens when we find out the church teaching we’ve trusted in has been built around pieces that don’t accurately fit the puzzle of the bigger picture? Among thousands of Christian denominations, people with good intentions have bought into an idea or mindset about Bible beliefs that are founded on doctrines of men about a Word that is not rightly divided. On the other hand, those of us who have discovered faith-based righteousness through God’s unlimited love and grace can easily forget about some of those legalistic teachings that bring people down. 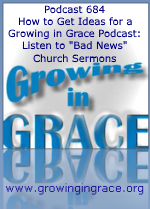 When we prepare to do a podcast that communicates the truth of God’s grace through the finished work of Jesus, sometimes it’s based upon having heard a sermon from a popular church teaching that left people in uncertainty, guilt, and condemnation. This is why we occasionally like to check-out some of these lifeless teachings in order to help remind us of what many church attendees are being subjected to and it inspires us to communicate the message of freedom found in the New Covenant.